How much do you care about terroir? How much does anyone really care about terroir? Now, just to make sure we are talking about the same thing, my definition of ‘terroir’ includes the soil, aspect, altitude and microclimate that all essentially contribute to individuality. And, if we agree on that, I know for a fact that Heston Blumenthal has a patchy interest in it, as do some highly distinguished members of the wine industry in places like Burgundy, Bordeaux and Champagne as well as the heads of several award winning wine companies.. Whatever they might say to the contrary. As for normal consumers, even the ones who take a keen interest in what they eat and drink, pay it very little attention. Now, I know that even by my standards this is a contentious statement, but I have tangible evidence to support my case. So, here goes. Terroir definitely exists and is undeniably crucially – influential in the way a wine tastes. It is not – despite what some chauvinist Frenchmen have suggested – exclusive to France. Vineyards in places from Turkey to Tasmania have individual, influential terroirs. With me so far? But terroir is also not limited to wine. Malt whiskies are influenced by the water from the local spring; coffee and tea to the humidity and altitude of the places where the beans and leaves are grown. Chocolate, cheese, honey and perhaps most clearly of all, olive oil, all bear the imprint of the place they come from. Olive oil comes top of this list because, as Chiara Planeta who is passionately involved with the award-winning oils produced by her family company in Sicily, points out, if you make it honestly, there’s almost no human intervention. You simply harvest the olives – earlier rather than later, ideally – and extract the oil as quickly as possible after they leave the tree. Fine olive oil is, in its way, as fine and noble a product as any wine, and just as ancient. And most people take zero interest in its terroir. When I say “most people”, I’m not talking about ignorant British or American consumers for whom olive oil is a foreign ingredient; I’m talking about the Sicilians who do their shopping down the road from the olive groves and use huge amounts of olive oil every day. Not only do they not take any interest in which part of Sicily their oil comes from, most don’t even really care whether the stuff on their salad is actually Italian. Most of the oils on sale in the two supermarkets I visited have brand names like Bertolli and are bottled in Italy but generally hail from groves in Spain or Greece or Portugal. In each of the shops, Sicilian oil represented a tiny minority of what was on offer. Sicilian housewives evidently choose their oil on the basis of its house style and price. In one little shop in a small village, there were two oils on the shelf: a Bertolli at five euros and a Sicilian for four euros fifty. The shopkeeper approved of my choice of the local oil, but evidently still needs to stock the global brand. This focus on style is even more evident elsewhere in Italian food shops. Italians care about coffee. And I’d say they probably care more about it than people in many other countries. But, here again, they show no interest in where it comes from. What they buy is the brand – Illy, Lavazza, Hag etc – and the level of strength which is helpfully indicated in at least one set of shops, by a set of colour codes. A British shopper used to the Costa Rican, Colombian and Brazilian coffees on offer in their local store would be staggered at the absence of any reference to provenance. What Sicilian shoppers buy is various versions of what Anglo-Saxons know as “Italian-blend”. I did see one reference to country: almost every Italian store has Lipton’s English Breakfast Tea. Sadly, I was unable to discover precisely where in these lovely islands, the tea plantations might have been situated. Now, at this point, I can hear a number of people angrily pointing out that their Italian friends DO care about tea and coffee and olive oil, and that the people who shop in supermarkets are just the ignorant masses. To which I would counter that these are precisely the same masses we expect to pay attention to wine terroir. But here I return to my original contentious contention that a great many people whose livelihoods depend on a belief in wine terroir have absolutely zero interest in the way regionality applies to coffee. I know this because they have demonstrated it by their actions: they have spent their money – a lot of money in some cases – on a Nespresso machine – or one of its competitors. Now, for anyone who has led a sheltered life, I’ll briefly explain that these are devices that were developed at huge expense by Nestle to enable ordinary mortals to produce espresso coffee of a guaranteed style, quality and consistency. 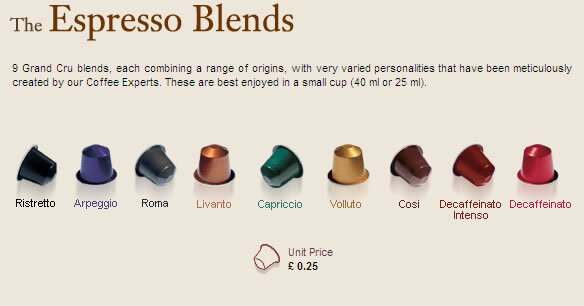 The system is highly ingenious: the coffee comes in little metal pods (“capsules”) whose colours and shape show the same kind of design flair as anything to come out of Apple or Bang & Olufssen. All you have to do to be sure of getting your desired cup of caffeine (or decaffeinated, naturally) is to choose the colour that relates to the style you want, pop it into the machine and press the button. Buying a Nespresso machine is a little like getting married: the expression “forsaking all others” springs to mind as one realizes that, until the patents run out, the only place one can buy pods that fit in it is directly from Nespresso shops or online. The range is not huge. Just three of the pods are described as “Pure Origin” – Dulsão do Brasil, Indriya from India and Rosabaya de Colombia. The others – Ristretto, Arpeggio, Roma, Decaffeinato Intenso, Livanto, Capriccio, Volluto, Cosi, Fortissio Lungo, Vivalto Lungo, Finezzo Lungo and Decaffeinato Lungo – could come from anywhere coffee is grown. They conform to the explanation on an Italian Lavazza packet that the origin may vary in order to maintain the consistency of the product. For a while, I tried to keep a rough tally of the number of Nespresso machines I encountered and the places where I found them. But after I hit my fourth Bordeaux chateau, third Champagne house and fifth head of a UK wine company, I gave up. They are becoming ubiquitous, with sales rising by 20% per year over the last decade. According to Nestle, over 21% of all espresso machines are now Nespressos, while a number of alternatives such as Sara Lee’s Senseo and Kraft’s Tassimo all make their own inroads into the tradition of selecting one’s own coffee from a range on a retailer’s shelf. I must confess to having rather mixed feelings about these machines. I don’t like the idea of having to buy all my coffee from one producer; I don’t like being restricted to a limited range; I don’t like the fact that they cost up to thrice what one might pay for good coffee purchased by the bag; and I don’t like the fact that all those pods have to be recycled – or sent to landfill. On the other hand I am really rather grateful for the fact that almost everywhere I go, people offer me pretty good coffee, and don’t have to go to any great trouble to prepare it. Now I know that Nespresso machines are, in the words of one coffee lover, treated as the devil’s work by his fellow enthusiasts. And I know that there is a keen band of people out there who care passsionately about the coffee they drink, choosing their beans with care and possibly even doing the roasting themselves. But these are an infinitely tiny minority of coffee drinkers. Most people appreciate the simplicity of buying by style and colour. So how does this apply to wine? Well, people are increasingly purchasing their wines by brand rather than country (think of Lindemans, Blossom Hill and Ogio in the UK and think of all those bottles of“Californian” branded wines whose contents are sourced from Chile or France. So far, they haven’t often been offered the chance to use a colour code when choosing their wine, but I can see this option developing too. I have recently done some interesting consultancy work with the Australian brand McGuigan on a range of colour-coded “Classic” wines that applies Nespresso thinking and the line “What’s your style?”. Some 9,000 people scanned a QR Code in a magazine – and just under 3,000 very happily shared their tastes for “fresh”, “spicy”, “intense” etc. The McGuigan wines are from Australia, but I’d be surprised if a similar concept could not be successfully applied by a multi-national brand such as Ogio. The place something comes from is either important – commercially speaking – or it’s not. And, judging by the way people, ranging from Sicilian housewives to Bordeaux chateau owners vote with their wallets, there are plenty of instances in which it really does not matter at all. And least anybody suggest the contrary, the argument that terroir matters more to wine than to, say, coffee is intellectually indefensible. It’s like saying that one can be prejudiced against a person’s religion but not her skin colour. Traditionalist wine folk will hate this theme and say that people really should care about teroir, but I’d recommend that they wake up and smell the (origin-irrelevant) coffee. Thanks for contributing to the conversation. I do appreciate your frankness and your passion. I so like the way you always prise open the difference between what wine nuts think and what most people do. Terroir is wine's 'double overhead camshaft' word, irrelevant it seems to most, but raising the pulse rate of the initiated. It is critical for selling a small number of high value wines, 'fine' wine, not irrelevant. It is also pretty important as a vague but important mechanism in branding for a lot of wines, say between £10 & £20 per bottle which are not 'fine' but not mass market either. The mechanism is the emotional aura a product conveys, in this case the technically weak but potent feeling that wines from small producers who care about their vineyard have a mystical link between the land and how they taste. For the mass market, it's scale, no fuss, price, distinctive labels, PR, distribution and promo that matter. Who cares about a DOHC when you can have a BOGOF? A super-interesting post! I know my customers enjoy tasting wines from a cooperative that produces wines by the same winemaker of the same composition from grapes grown in different villages (and labeled with the village name). And I enjoy comparing single origin (or even single plantation) chocolates made with the same type of bean or mix of beans when I get a chance. Likewise for coffee (although it's more difficult to find single plantation) and olive oil. But on a daily basis, I think you're right, it doesn't matter all that much and style and consistency are more important to most people. This was a great post. I would not spend too much time worrying about stating the obvious. It seems to me that many use that characterization because they wish they had thought of it or said it first – and someone smarter has said it better than they. My problem with the concept of terroir is that it says/explains everything and nothing at the same time. There is so much wrong with this article! Consumer habits are largely influenced by the powerful marketing campaigns of giant multinationals such as Nestle, Bertolli, etc. While it is true that most consumers don't give a toss about provenance I would argue that they have also adapted their lives to the mediocre products that are shoved in their faces. Speaking as an owner of two coffee houses in Brighton, UK, I have made a moderate, and not too pushy, effort to talk to our customers about the origins of our coffees and teas, which has been met with a great deal of interest. As a matter of fact, we have created a whole new revenue stream of customers who come in for the single origin daily filter that we have on rotation. If you haven't already noticed, coffee labels in supermarkets have MORE information on them, typically indicating the country of origin at the minimum, and quite often more detailed information such as the cooperative that produced it. This is a response to increased consumer interest. I think people really are interested in these types of things if approached in the right way by an enthusiastic advocate. The 'third wave' of coffee that has taken off across the globe and has been a huge boon to independent coffee houses, but also for consumers who are developing a keen interest in the culinary parts of their lives. Part and parcel to this process is real communication to and from real people – i.e. customer service – something that has been sorely lacking in supermarket type environments. This article is advocating a dangerous propensity to dumb down wine labels so as to create another cheap and easy market for lazy consumers who no longer have any idea where there food comes from, who grew it, and what the true human costs of their consumption entails. I find it lacking in any faith that the general public can engage and absorb quality information about their foodstuffs. There are a couple of successful wine merchants in Brighton who have found favour with specialists and non-specialists alike because of their focus on service. No need for colour coding at either of these shops. The idea of traceability and sourcing is what has driven the food revolution in Britain over the past 10 years, simultaneously whetting the appetite of everyday consumers who are more inspired than ever to cook for themselves. Given that the UK spends more on olive oil than on vegetable oil, and consumes more than double what it did 10 years ago, your off-handed comment about the British (and American) public being generally ignorant of olive oil is a statement well out of touch in the first place. And as an aside, to romanticize Italian coffee culture as a country of experts is completely out of touch. Much of the worst coffee I've tasted has been in Italy, which is generally bitter and over-extracted and requiring heaps of sugar to make palatable. It's like saying the British know about tea – they don't. It is merely an ingrained part of their culture. Do we really need to make consumption any easier for an already detached, overweight and generally irresponsible consumer base? No, we don't. What we need is to continue to work towards building an awareness and appreciation of the vast array of quality products that are available to us. R Curtis, thank you for thanking the trouble to respond to my post. You may have noticed that I was not generally referring to the UK in it, but to Sicily where I happened to be while writing this piece. Most of what I wrote might also have applied to France or Spain. Or Britain. You may not personally like Italian coffee. Italians like Italian coffee, just as the Brits like English Breakfast Tea. And neither group generally cares where it comes from. And nor do most other people. I applaud what you and others are doing in Brighton, just as I applaud the farmers market movement. But to suggest that these reflect the general trend is wishful thinking. The fact that people are spending more money on something – anything – does not mean that they know anything about it. Or are intersted in it. My post was, whether one likes it or not – and you evidently don't – based on fact. You may disagree with it; you may dislike it; you cannot say that it is “wrong”. As you say yourself, “it is true that most consumers don't give a toss about provenance”. All that you dislike is my conclusion that we should give consumers what they want rather than what we (you) think is good for them. Your point about not wanting to make life easier for a “detached, overweight and generally irresponsible” consumer base is an interesting one. Based on that logic, anyone designing a building with public access should not offer lifts or escalators to anyone travelling less than three or for storeys – unless they can prove physical incapacity. Just think what a move like that would do for national fitness. It's a truly brilliant notion, now I come to think of it. But sadly in a free market, it's sadly flawed. People who don't want to walk up three flights of stairs in your shop will simply go down the road to the shop with the lift. France has not embraced the “mediocre products” that are found on the shelves of the wine departments of most UK supermarkets. French wines are still ranged by French regions, as they have always been. And over 1/3 of the French poulation now classes itself as non wine drinkers, while that state also applies to half of all French women. So there's your choice, at least in wine terms: a small number of people conforming to your standards or a larger number of people enjoying themselves. We may have to agree to differ on which of these we prefer.